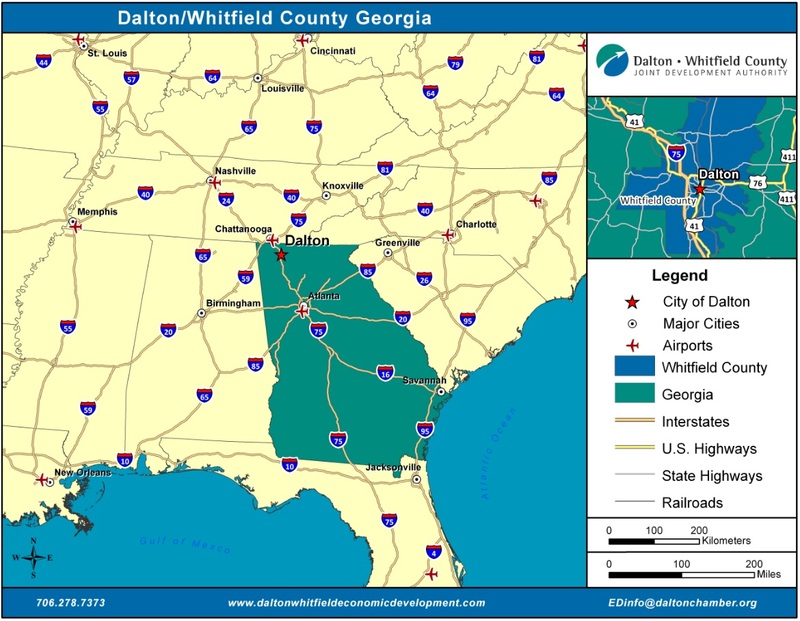 Dalton and Whitfield County are located 25 miles south of Chattanooga and 85 miles north of Atlanta. 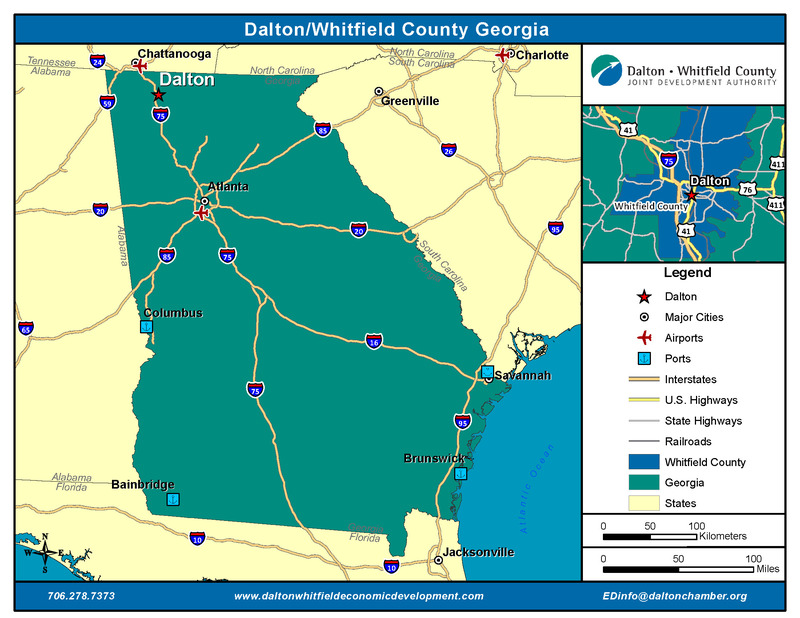 Dalton's business environment is strengthened by its location on Interstate 75 and the presence of two commercial airports within short driving distance. The area is within a day's drive of half the country's population. Over 80,000 vehicles travel on Interstate 75 through Whitfield County each day. Within a 350 mile radius, you'll also find 79 of the Fortune 1000, as well as 13 major US markets. 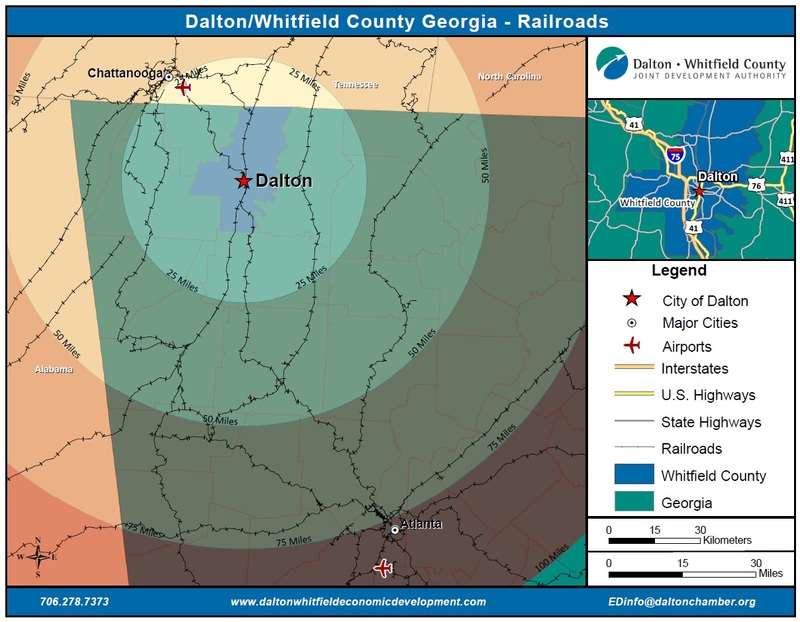 Dalton is currently served by two different rail mainlines, CSX and Norfolk Southern. Dalton is also home to one of the few dual served rail trans-loading facilities in Georgia, operated by both Norfolk Southern and CSX Transportation. These facilities provide rail-to-truck and truck-to-rail transfer services. On-site personnel is available to meet customer needs. The local facility is equipped with appropriate telecommunications services, inventory management support, security-fenced and lighted, on-site truck scale, equipped with latest transfer machinery, as well as a truck wash. For more information, see the websites of CSX Transflo and Norfolk Southern. In fall of 2018, the new Appalachian Regional Port, through CSX, will provide a direct 388-mile rail route to the Georgia Ports Authority's Garden City Terminal. The port is located just 30 minutes away from Dalton located in Murray County. Located in an industrial belt, including the production and export of carpet and flooring, automobiles and tires, the Appalachian Regional Port will make those commodities more competitive in the global market while reducing carbon emissions according to the Georgia Port Authority. Just 90 minutes away from Dalton is a world-class international airport offering numerous direct flights. Closer to home are two other airports that provide travelers with a variety of options.